Why have so many Canadian university presidencies failed? Stories of six unfinished mandates raise concerns about governance. “Turfed,” “let go abruptly,” “resigned” or “quit” – the language may change but the scenario itself is discouragingly frequent. In the past decade alone, at least 18 Canadian university presidents have had their first mandates cut short. This is costly and unfortunate for all concerned. And my research suggests it’s largely avoidable. In the course of completing my PhD studies for my thesis (Leadership in Higher Education: Case Study Research of Canadian University Presidents with Unfinished Mandates), I spent time with six of the affected leaders, exploring what factors led to these failures and what changes could be made to reduce their frequency. The presidents represent diverse disciplines and institution types, but share similar backgrounds. All are academics from outside the universities that appointed them. Evenly split female and male, they represent a common demographic in terms of age, race, level of education and experience. Each president lived a unique experience and yet their stories share many common patterns. In all, six areas of concern emerged as having played a role in undermining their ability to lead. These include board governance and communication; trust within the executive team; mentorship; the role of the predecessor; the effectiveness of the transitional process; and issues relating to diversity. Each of the presidents with unfinished mandates whom I interviewed raised significant concerns regarding board governance and communication. All reflected extensively on their troubled relationships with their board of governors and, in particular, the board chair. 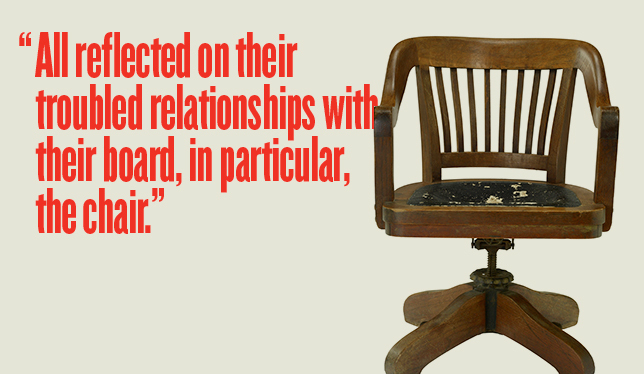 In a few cases, a change of chair early in their mandate made the board-presidential relationship more difficult. Some admitted they should have made board relations a larger priority, and wished they’d invested more time in the relationship. But, as an example of why they hadn’t, one president believed that calling on the board too often might be seen as a sign of weakness. The informants shared significant concerns about multiple aspects of board governance. An overall lack of good governance was apparent in each of these cases of unfinished mandates. All too often, the board implemented a governance review only after the unfinished mandate. Other concerns related to ethical issues and governors’ ignorance about their roles and a misunderstanding of the academic enterprise. Some presidents also raised concerns regarding the board’s role in the hiring process and the governors’ subsequent lack of engagement during the transition. The involvement of executive search firms sometimes created ambiguity, with some informants feeling that the board had been too distant from the hiring process. More troubling, all of the presidents I interviewed noted their boards’ failure to disclose important issues – from financial concerns and union relations to impending legal situations – in advance of the hiring. Closely related to the theme of board governance, all six presidents shared a deep level of mistrust with at least one member of their executive team – the provost, the secretary, vice-president finance or vice-president external. For many reasons, however, including pressure from the board in some cases, the presidents did not feel comfortable or confident making a change within their executive team. In one case, a member of the executive was himself an unsuccessful applicant for the president’s job, which obviously created tension. Other challenges included a particularly close relationship between a vice-president and the board and important communication that intentionally excluded the president. Some informants shared a desire for mentorship or further leadership support in their role, reflecting on how lonely it can be at the top. In retrospect, some would have appreciated a wise person inside the institution with whom they could have safely shared their challenges, concerns and questions regarding issues such as university culture or their role. A colleague, another university president or a former president could also offer this mentorship support, they said. In a similar vein, each of the presidents shared an unhelpful or non-existent relationship with their predecessor. In one situation, the past president stayed on campus and acted somewhat as a “closet president.” Many of those I interviewed with unfinished mandates were surprised by the unwillingness of their predecessor to share insights and key transitional information regarding the institution. Having come from outside the universities they subsequently led, such insider context would have been valuable. Another significant common challenge relates to leadership diversity. Just 19 percent of Canadian university presidents are women, and yet the last six out of eight leaders to have their mandates cut short have been female. Other studies have explored this phenomenon. Viewed as strong relationship builders, women are often sought out within times of crisis and brought into an organization at risk. This may help to explain these tragic numbers. Interestingly, even the male presidents reflected on the “old boys’ network” within Canadian universities – at the board and executive levels in particular. In fact, when one female president questioned her board chair on the board’s lack of diversity, she was told that there was no need for worry as they had a female president. My interviewees underlined the need to make proactive changes to ensure that support is given to diverse leaders in their roles as institutional heads. All of them feel scarred by the process of having been let go, to a greater or lesser degree. Canada faces a shrinking pool of candidates interested in becoming a university president. These leaders are chosen based on an engaged and inclusive process, involving many campus stakeholders. Canadian university leaders, policymakers, board members and executive search firm leaders have an obligation to take a critical look how they can do better. Seven Canadian university presidents are beginning their mandates this year. In light of my research findings, I am concerned and apprehensive as they start their presidential tenures. As some Canadian university presidents with unfinished mandates observed, it’s critically important to use the transition period to solidify relationships in pursuit of success. Strong board governance, relationships of trust, support to leaders, and a focused strategy for diversity and leadership are essential components of this strategy required for change. Julie Cafley is vice-president at the Public Policy Forum and recently completed her PhD in educational leadership at the University of Ottawa. Excellent article, Julie. I’ve been watching the goings on in my own backyard – the University of British Columbia – as you no doubt have, and this is obviously highly germane. This includes a woman who has been sought within a time of crisis. What I am also interested in is what the six feel their own personal responsibility may have been in the “failure to launch”. Very specifically, did they feel fully prepared and qualified for the job they were given and did they take steps to proactively address any identified gaps? This should be differentiated from the sorts of “I should have managed that relationship” or “I should have let that person go” problems that are in fact external. Thanks Christopher. As all of the presidents that I spoke with were academics, they were quite self-critical and able to name key elements that they would have done differently in their mandate. Some examples include: needing to invest more time in board relations, making changes within their executive team sooner, attempting to advance change too quickly, etc. There were also some presidents who noticed red lights in the hiring process that they simply overlooked. My research was more focussed on the system-wide issues and less on the unique challenges of individuals in their leadership mandates. I was intrigued that the presidents were not overwhelmed by the complexity of the role. They understood well the challenges and did not create false expectations regarding the role of university president. What validity do we have here though? You ask a sample of those let go- that agreed to participate- and even then you are only getting the opinion they wish to share with you. Not surprisingly, as with most humans, the vast majority of explanations for failure are external to themselves. It would take a huge degree of self-awareness and honesty to see one’s own role in the mess (the exact attributes you are more likely to find in successful than unsuccessful leaders). If you’ve ever seen people involved in conflict, they have two entirely different realities. Likewise, almost every under-performing or fired employee when asked to explain what went wrong is likely to focus on things not about them. Equivalent to our students who typically say the test was too hard when they blew it. So while you provide a tiny bit of information on the problem, it is an extremely biased one and without much more data, it really doesn’t tell us very much. And should be acknowledged as such. Thanks for your feedback Jan. In my thesis, I do state quite explicitly that my research is coming from a single perspective – that of Canadian university presidents with unfinished mandates. Due to confidentiality concerns, I did not speak with board members, other members of the executive, faculty members, etc. As academic leaders, I observed that the presidents were quick to name their role in the failure and spoke quite openly about what they would have done differently. As an example, some regretted that they had not invested more time in board relations, others wished that they had made early changes within their executive team. Another cited the fact that the changes that they led occurred too quickly for the campus culture. The reality is that all of these leaders are quite impressive. They are strong academics with previous leadership experience and solid reputations. These are not typical experiences, and many factors led to the “perfect storm” of their unfinished mandate. The presidents that I spoke with offered some very tangible experience and learning, that, in all cases, was not shared previously. No, you cannot generalize my research; however, there is an important story to tell, and my research is the beginning of a much-needed discussion. And, yes, further research is required.